CRocs summer wedge sandal. Size W4 which is about UK1. Not suitable for wide foot. Brand new. Colour brown and beige. 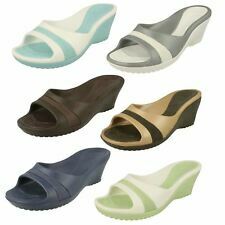 CROCS WEDGE SLIP ON STRAPPY SANDAL SIZE W11 (9). Condition is Used. Dispatched with Royal Mail 2nd Class. CROCS PATRICIA II RRP £40. With a 2” wedge and a Croslite™ material footbed, you will love these wonderful wedged shoes. They are advertised on the Crocs Website as shown below. The Patricia features. (Cork platform wedge. Tan Slip on open-toe sandal. Size; US 10 - UK 8. Happy to answer :). Ladies Crocs Tan Strappy Mules Wedge Heels Size 6, . Condition is Used. Dispatched with Royal Mail 1st Class. Lovely Cork finish Wedge heel, worn but not much. Have that lovely crocs bouncy feel. Crocs Grey Wedge Shoes Size UK 6. Condition is Used. Dispatched with Royal Mail 2nd Class. Ladies Crocs grey size uk 5.5 us W 8 pre owned, but in good condition. Please see all photos to check condition. Thank you for viewing. 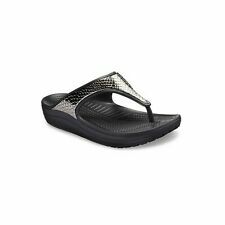 CROCS 'PATRICIA' BLACK SANDALS - UK8 (US10) - USED (BUT AS NEW). Condition is Used BUT ONLY WORN ONCE SO AS NEW. 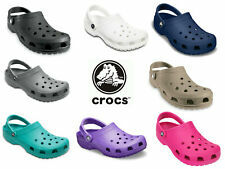 Vibrant ladies genuine crocs, toepost, arch support and massage sole From USA. 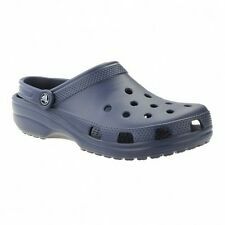 Genuine ladies Crocs, bought in the U.S. Lovely vibrant colours with toe post and contoured inside sole for arch support. Also has slightly raised beading to inner sole for massage when walking. Great every day shoe - for hols or shopping I also wear mine at home :-). Generous amount of room for the foot so no squashing of your feet by the straps, yet very secure and comfortable, bargain. Dispatched with Royal Mail 1st Class. Size US 10 UK 8. Crocs logo at the side of the ankle. 2" wedge heel with a grippy rubber sole bottom. they are finished in black rubber, with a gloss finished toe.